Thank you very much for writing this review, Ian. 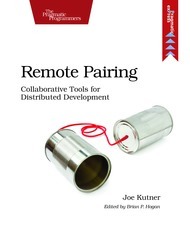 It’s good to hear that remote pairing is a important part of your business. I have started a business myself and our developers are located around the world. I think it is a key strength if your lead developer or CTO (I am the CMO), can manage and work in remote teams. I have seen startups which could reduce their burn rate by factor 5, just by making use of outsourcing and working remotely. I understand that this does not always work in every scenario, but I think it is something that more teams should pursue. We use Trello extensively for our project management (rather than Asana), and we use grove.io as our internal chat system, definitely an essential adjunct. ScraperWiki is pretty small so we don’t need a huge amount of functionality from chat, that said we have considered Slack. We’ve not had a need to use something like Webex internally, we aren’t *that* distributed a team – we have a couple of people work a couple of days a week from home. And are happy for ad hoc homeworking. We’re actually looking for timesheets services at the moment, so TrackingTime looks interesting. It doesn’t feel in the spirit of a startup though! When I last used Yammer it struck me as being corporate facebook, uptake in the large traditional company I worked in was low (i.e. about 1% workforce, and those concentrated in IT).